Black-faced Spoonbill is a threatened bird species of global concern. It mainly inhabits East Asia. Over the last decade, the number of Black-faced Spoonbills had shown an upward trend with a record total of 2,725 birds this year, accounting for an increase of 1.2% from last year. In addition to being a well-known star creature of the wetland in the eyes of the public in Hong Kong, the Black-faced Spoonbill is also a globally threatened species. To conserve this rare species, numerous conservation intermediaries and governments in the region have collaborated to conserve the habitats of Black-faced Spoonbill and to undertake various studies since 1990s. A conservation action plan of Black-faced Spoonbill was inaugurated in 1995 with revisions and updates made in 2010. Emphasis is on the establishment of more conservation areas, commissioning more detailed surveys in their breeding grounds and strengthening regional collaboration. At present, habitat destruction and deterioration remain as the biggest threat to the survival of Black-faced Spoonbill. Development projects have been undertaken in many coastal areas, such as in South Korea, Macau, Fujian, Zhejiang and Hainan. Illegal poaching activities are still observed in some locations. For instance, a total of 5 Black-faced Spoonbills were found and confiscated in a restaurant in northern Vietnam in December 2010. The Deep Bay area in Hong Kong is under huge pressure for development. As such, the conservation of Black-faced Spoonbill still has a long way to go to assure the future of the species. Increases were observed in mainland China, Taiwan and Vietnam, while decreases were noted in Deep Bay, Macau, Japan and South Korea. 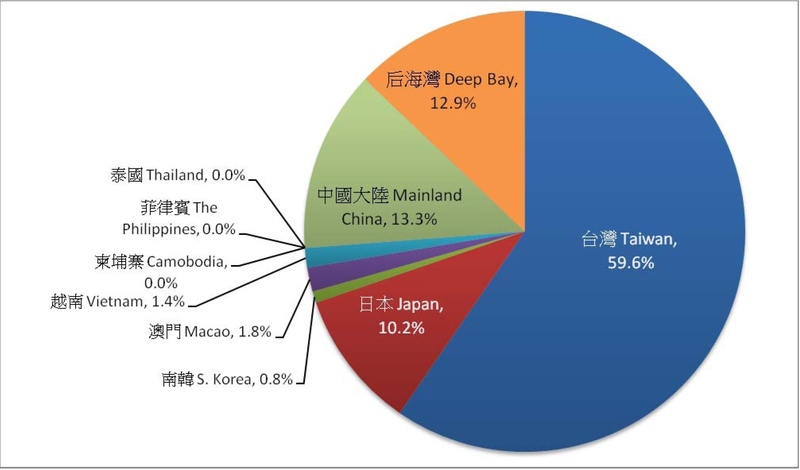 Locations included in this census include South Korea, Japan, Shanghai, Zhejiang, Fujian, Guangdong, Hainan, Taiwan, Kong Kong & Shenzhen, Macau, Vietnam, the Philippines, Thailand and Cambodia. This Society would like to take this opportunity to thank all regional organizations and volunteers for their participation in the census, contributing to the smooth conduct of this census throughout all years and therefore better conservation of Black-faced Spoonbill in the region. We are also indebted to Schmidt Marketing (HK) Ltd for sponsoring part of the expenses incurred.